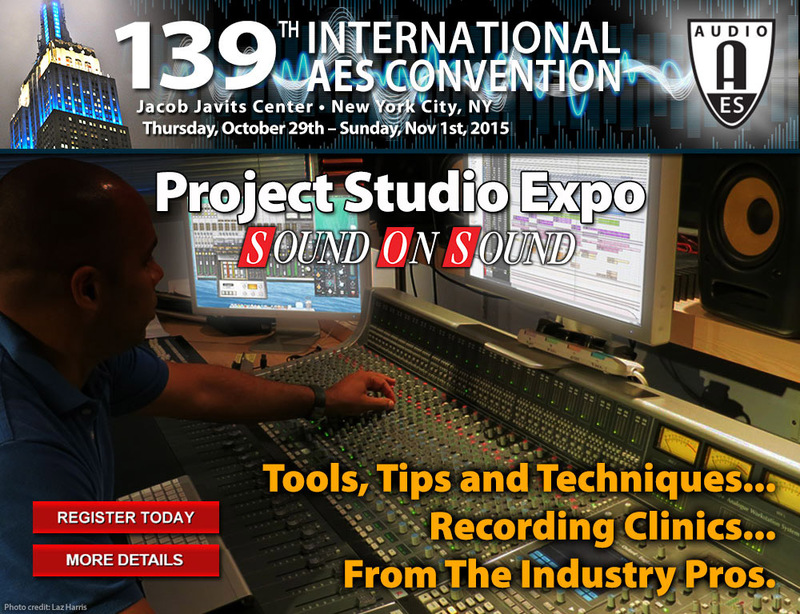 If it’s about audio, it’s at AES, and the 139th AES International Convention, October 29 – November 1, 2015, at the Jacob Javits Center in New York City, is where the Audio Engineering Society will once again showcase its popular Project Studio Expo (PSE). 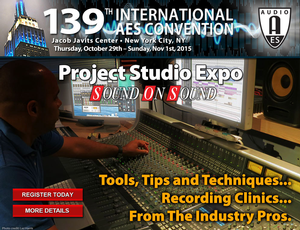 Taking place October 30, 31, and November 1 at the PSE Stage on the Exhibition floor, the Project Studio Expo offers presentations targeted to working in personal and project studio environments and is open to all AES139 attendees with either a FREE Exhibits-Plus or Premium All Access badge. This latest edition of the AES Project Studio Expo, presented in association with Sound On Sound and sponsors Genelec, Neumann and Prism Sound, offers attendees an ideal environment to listen, learn and connect with their peers, while bringing together the latest tools, techniques and experts in audio engineering and production. This year’s presenters on the PSE Stage for days one and two are slated to include respected industry veterans Craig Anderton, Larry Crane, Fab Dupont, Brian Jackson, Manhattan Producers Alliance, Hugh Robjohns, Mike Senior, John Storyk and Paul White. Topics cover a wide range of interesting and relevant topics, from “Making the Most of Your Project Studio Purchasing Budget,” “The Five Most Common Project Studio Recording Mistakes,” “Personal Networking for the Audio Professional,” “Outside the Box: Alternative Outlets for Your Music,” and “Building and Developing a Career,” to more technical issues including “Levels, Headroom, and Loudness,” “The REAL Skills You Need to Record Professionally,” “Mixing an Ensemble Recording,” and more. On the third day of the Project Studio Expo, November 1, premier sponsor Prism Sound will take over the PSE Stage to present their “Mic to Monitor” series of educational seminars and workshops. Targeted at all levels of music production and engineering attendees, Mic to Monitor aims to dispel the many myths surrounding the recording process. The events answer all-important questions, such as what makes great gear “great,” what it takes to become a successful and in-demand audio engineer, how recording professionals tackle different aspects of their productions, and how a hit sound is achieved. Each seminar features presentations from recording professionals, with audience Q&A, and an opportunity to demo and win recording equipment. For the latest information on AES139 Convention Registration and Housing, visit http://www.aes.org/events/139/. If it’s about audio, it’s at AES.